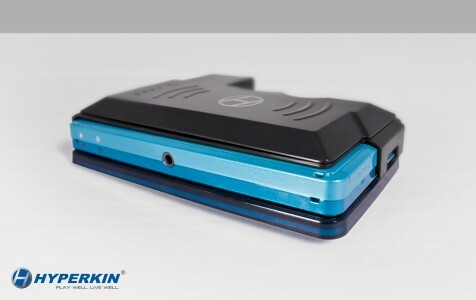 While the Nyko battery pack was literally a second battery that required the removal of the old one and thus hoped you had steady hands in the car or on the train so as not to drop and lose the little screws, this new model by Hyperkin is extremely simple, with no requirement to take anything out of the 3DS. It extends the battery life and appears to take advantage of the same tech used in the included platform. One assumes, naturally, that you have to charge the attachment separately, but there really aren’t a lot of details out right now about it. What is know is what you see in the above picture and the one after the jump. Both show that it appears to be a very small attachment that just snaps on and is easy removable. It also keeps the system rather portable assuming you carry it in a different pocket. In the end, this appears to be the superior way to extended life in comparison to Nyko. NEWPORT BEACH, CA (MAY, 2011) – Hyperkin, a recognized and trusted brand of video game peripherals, has announced the upcoming launch the 3DS Powerplus designed to provide extra battery life for the Nintendo 3DS handheld video game system. Providing an 1800 mHA battery, the 3DS Powerplus more than doubles the playing time of the 3DS. The 3DS Powerplus is a lightweight, sleek 1/4” design that slides onto the back of the 3DS while allowing full access to all of the systems original functions such as the cartridge port, stylus, SD card and all the control buttons. It also provides an excellent grip and includes a battery LED indicator.